Engaging Educators in Community-Based Professional Learning | Clarity Innovations, Inc.
A community-based learning platform for educators highlights best practices for ongoing professional development in education technology. This Fortune 100 company asked us to find a way to engage teachers in professional learning that is both research-based and grounded in best practices, while exploring current learning trends and providing a space for teacher collaboration. We relied on our expertise in professional development to create an online space that is forward-thinking and inspiring for educators incorporating technology into their teaching practices. Although well known for their innovative professional development and online teaching tools, an ongoing challenge for the Fortune 100 company had been providing educators with one central location to explore and access professional resources. Having previously worked with Clarity Innovations on developing many of these tools and resources, the Fortune 100 company extended its engagement with Clarity to provide the expertise necessary to implement a new approach to an already-existing online community platform and bring educators together around professional learning materials. We applied our expertise in professional development and digital interactive design to collaborate with the Fortune 100 company on brainstorming and gathering requirements for the initial iteration of their online community. From there, we expanded our work to helping define the information architecture of the collections of content and designing the landing pages for each. Throughout, we supported their promotional efforts with giveaways, contests, and informational webinars on the front end, as well as assisting with the technical backend of their Jive-based content management platform. We redesigned pages with an engaging user interface that provides quick at-a-glance access to courses, exemplary videos, online tools, apps, books, and toolkits. Resources were organized by topic and grouped in a way that allows teachers to discover related materials. Our new design allows educators to search and filter recorded webinars, and then view the webinars and participate in related discussions. Upcoming webinars are also featured, with pre-webinar discussion posts and registration links. 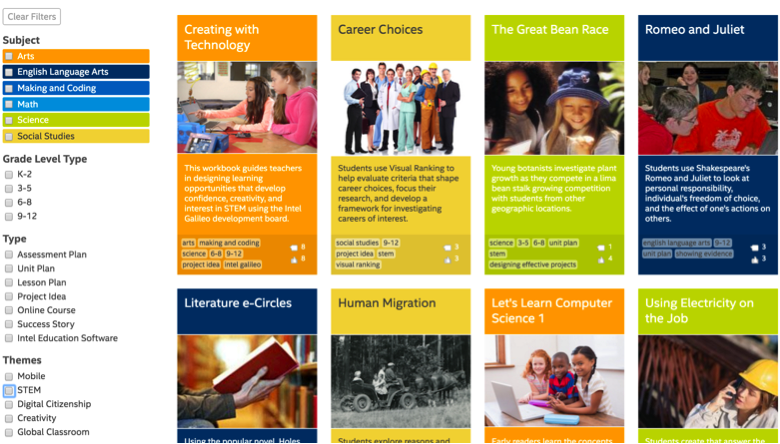 We also custom built an Idea Showcase to provide educators with an opportunity to search unit and lesson plans, project ideas, assessment plans, and online courses across all subject areas. Each technology-rich idea invites community members to post a comment or ask a question in the discussion forum, allowing for collaboration and shared learning experiences. Since our involvement starting in 2009, the Fortune 500 company's online learning community for educators has grown from 1,500 members to over 34,000 worldwide in 2015. With the tie-in to self-guided online workshops we developed, participation in the discussion forums has grown three fold since 2012.